Deepa – Light festival on Bharani star day in Karthikai (November-December), Shivarathri in Vaikasi (May-June), Arundra Darshan in Margazhi (December-January) are the festivals celebrated in the temple. Lord Shiva appears facing west and the Goddess facing east. The shrines are designed as such that the Lord and Goddess appear right to each. The temple is open from 6.30 a.m. to 12.00 a.m. and 5.00 p.m. to 8.00 p.m.
+91- 4286 - 257 018, 94433 57139. Ambica called Her son (Mahan) here. Hence the place was named Mahanur but changed as Mohanur later. Lord Muruga temple, where He stopped to the call of Ambica is on a hill just a little away. Devotees perform special abishek to Lord Mother offering vastras. As the temple is closely related to Deepa worship, a lamp is ever burning in Lord’s shrine. Hence, Lord is praised as Achala Deepeswarar. Achalam means that not wavering and firm as a hill. As the Lord is in His meditation posture, the deepa too is motionless. Mother Madhukara Veni is facing east gracing the devotees. 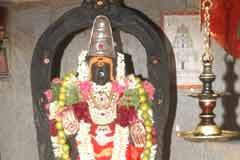 The idol is made of a single stone including the frame called Thiruvatchi. She was chasing Lord Muruga to take Him back to <?xml:namespace prefix = st1 ns = "urn:schemas-microsoft-com:office:smarttags" />Mount Kailash. Madhu means Milk. As a mother, milk flowed from Her breasts when she called Muruga. Special pujas are performed in the shrine on all full moon days. People pray these days seeking child boon. In days of yore, there was only the Shiva shrine in the temple. One Kuanarayee, a staunch Lord Shiva devotee was selling curd for her livelihood. After sales, she used to offer the remaining curd to Lord Shiva as nivedhana and consumed it then. She became pregnant and delivered a handsome male child. People in the village suspected her chastity and spoke ill of her. Kmarayee simply told them Lord Shiva knew her purity. While bathing in Cauvery, she merged in the river. Mother Ambica came from the river and granted darshan to all and made it known to all that she was curd seller woman. The shrine for Ambica was built then. 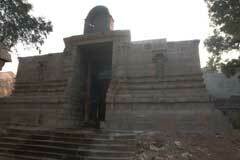 As Ambica lived here as Kumarayee, she also bears that name and Lord Shiva Kumareeswarar. Lord Shiva is facing west and Ambica east. The shrines are so structured that both are right to each other, a rare design in this temple. There is a small Banalinga near the presiding Lord said to have been worshipped by the curd woman. Pujas are performed simultaneously to both. 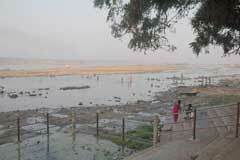 River Cauvery flows here from north to south as in Kasi-Varanasi. Lord is facing the river. Special pujas are performed to Ambica on the Aadi 18th day falling in July-August. 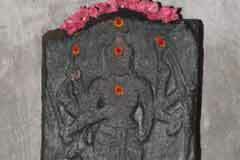 In between the shrines of Lord and Mother is the shrine for Lord Muruga with His consorts Valli and Deivanai. Lord Vinayaka blesses the devotees from a shrine in Prakara sitting with a serpent. 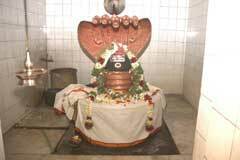 Those afflicted by adverse effects of serpent planets pray here for relief with milk abishek. There is another Vinayaka outside the temple under a neem tree where women seek wedding boon offering Mangalsutra. 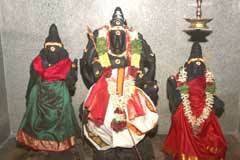 Mother Varahi, Chamundi and Vaishnavi are in wall sculptures on the prakara wall. 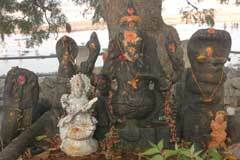 Pujas are performed on the 8th day of new moon fortnight for the three Davis and Lord Bhairava. 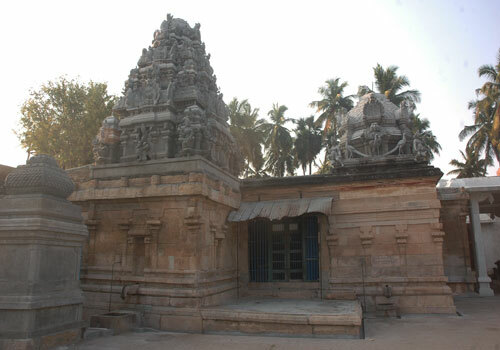 Lord Sarabeswara shrine is outside the temple. Mother Shiva Durga is on the wall in the front mandap. 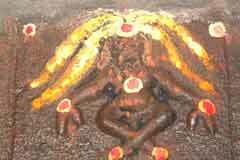 As a tradition, Mother Durga is on the ghoshta wall of Shiva shrine with Maishasura under Her feet. Here, Duirga is with eight hands on the rear wall on a lamb vahan. 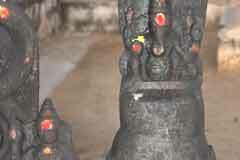 This is also a rare feature found in this temple. Mohanur is 18 km from Namakkal. The temple is 1 km from the bus stop. Auto facilities are available. Hotel Vangili International: +91-4286-232 733; 232 744; 232 777; 232 666 232 755.